It was founded by young German and Romanian workers and clerks from Bucharest factories; then highschool students joined. In 1906, within National Exhibit (a huge political-cultural event in Romania, organized in "Carol" Park - built at this event - in the purpose of celebrating 1800 years of first settlement of Roman colonist in ancient Dacia and its conquest by Roman Empire, 40 years of King Carol's rule and 25 years of settlement of Romanian Kingdom), "Olimpia" was invited to show a demonstration of that new sport, football, inside "Arenele Romane" amphitheatre. 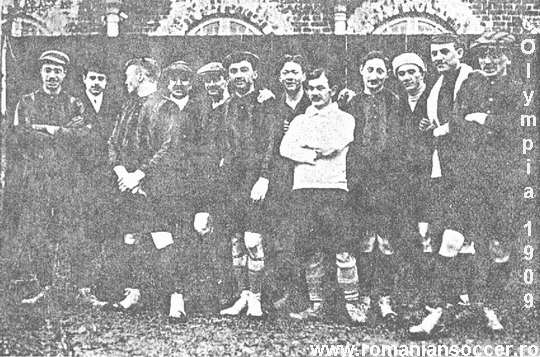 At this event, the first football trophy in Romania, was awarded. The equipment was ordered by players' own money as follows: shirts from Paris, shoes from London and ball from Koln-Germany. A young enthusiastic offered a room in his house for storing equipment and as a changing room. Among the hardships of beginning were the parents of players who didn't let them play instead of studying for school and marking the playing ground (the tools were carried by horse-tram and were domestic). Around 1915, team dissolved itself, some of the players "betraying" football for rugby or transffering to "Colentina". After World War I, it is set up again and, in 1921 plays mostly in regional championship of Bucharest. In 1927-1928 "Olimpia" plays in final tournament of national championship (pre-divisional). After World War II it dissolved itself.